Part of the Georgia World Congress Center Authority’s (GWCCA) mission is to enhance the quality of life of every Georgian. We do this through a number of activities on our campus and through involvement with the surrounding community. 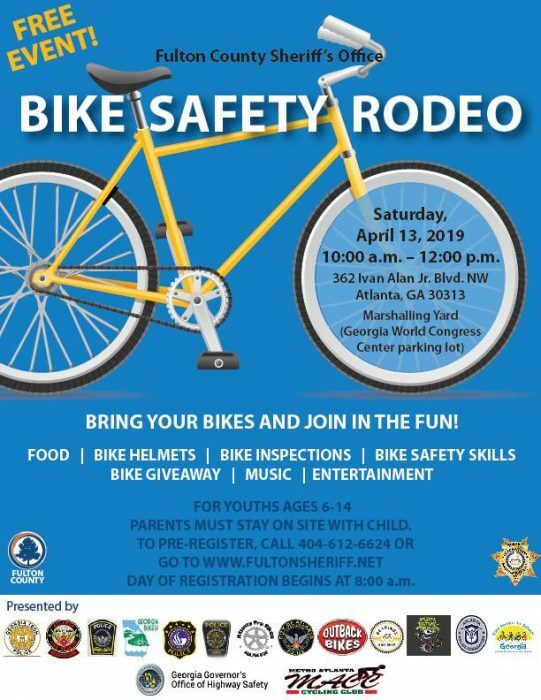 On Saturday (April 13) the GWCCA hosts the fourth installment of the Fulton County Sheriff’s Office Bike Safety Rodeo. Taking place in the GWCCA’s Marshalling Yard, this free event for ages 6-14 (parents are welcome, too) is a part of a grant program that teaches pedestrian safety in communities throughout Georgia and is funded by the Georgia Governor’s Office of Highway Safety. According to a Stanford Children’s Health report, approximately 100 children are killed and 254,000 more are injured each year due to bicycle-related accidents. While the rodeo focuses on bicycle education and safety, kids also can participate in a safety skills challenge, have their bikes inspected, and get a free bike helmet. Some kids attending will even get a new bike thanks to donations by area businesses and partnering police departments. “The Georgia World Congress Center Authority’s Marshalling Yard offers us a large flat space that will allow us to have more activities than in years past and will allow us to grow into the future,” said Sergeant Johnika Price of the Fulton County Sheriff’s Office. Typically used for staging by exhibitors and large-scale shows moving into the Georgia World Congress Center, the Marshalling Yard is a key location on the Authority’s campus that demonstrates the versatility of our facilities and, more importantly, that our brand service promise of creating compelling guest experiences just may show up where you least expect it. The bike rodeo is scheduled to run from 10 a.m. to noon Saturday with day-of registration starting at 8 a.m. More more information, visit http://www.fultonsheriff.org/.